Job opening for next year! Anyone interested in becoming West Tallahatchie Habitat for Humanity Affiliate Coordinator next year? My two year term with AmeriCorps ends at the end of July and we need someone with a passion for Habitat for Humanity who is willing to move down to Mississippi to run the affiliate. You would be employed through AmeriCorps which has awesome benefits for college graduates or someone interested in going to college in the future. Affiliate Coordinator is a full-time job but my cousin and I can both attest that it has been a wonderful experience. An experience of a lifetime! You would be coordinating volunteer groups, working in the office to make sure everything is kosher with Habitat for Humanity International and the state, working with homeowners and buying materials to build with. All of this while learning how to build a house! Building with volunteer groups and getting an opportunity to meet new people from all over the country makes it all worth it. If you’re interested or have further questions please contact me, Allison Patten, at wthabitat@yahoo.com or 662-345-6200. Thanks for your interest in West Tallahatchie Habitat for Humanity. Keeping spreading the word of our good work! A group of 22 individuals came all the way from La Canada, CA to West Tallahatchie Habitat for Humanity in Tutwiler, MS to make a difference and build a house for a family in need. They arrived with hammers in hand, high spirits, and a willingness to build. 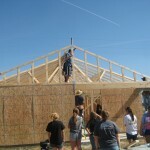 In one week, October 18-22, they accomplished what takes many volunteer groups 2-3 weeks to do. They framed up an entire 3 bedroom, 1 bath, 1,100 square ft house, pushed, set and nailed trusses on top of the frame and sheeted the house as well as the roof to create a barrier from the outside. 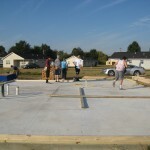 It’s hard work building a house, ask any of the 22 volunteers, but in the end, they would have kept working if it meant staying down in Mississippi and providing service to others. WTHABITAT.ORG 2.0 is live! But it’s not quite finished yet. Please bear with us as we clean up some of the dust from our extensive remodel – but, in the meantime, enjoy the increased functionality (like online donations!) and new information that is already available.